Nationwide Arena opened September 9, 2000 as the home of the National Hockey League's Columbus Blue Jackets. 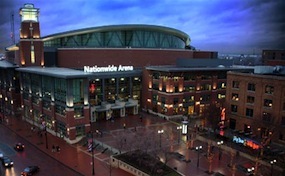 The Nationwide Arena box office is located on 200 West Nationwide Blvd in Columbus, Ohio. The venue was built for a construction cost of $175 million and has a maximum capacity of 21,000 for concerts. The day-to-day operations of the facility are currently run by Ohio State University. Many big events have passed through Nationwide Arena including multiple UFCs, PBR's Built Ford Tough Series, the NCAA Basketball Tournament, and the NHL Draft. Some of the most popular Nationwide Arena tickets have been for the Rolling Stones, Aerosmith, Miley Cyrus, U2, Britney Spears, The Police, Bob Dylan, N'Sync, and the Jonas Brothers. ArenaColumbus.com is not a primary supplier or affiliated with any official website or box office. We proudly offer access to a wide selection of events to all secondary market inventory online. Prices may be above or below face value. To order tickets to all Nationwide Arena events simply call our operators at anytime or follow the steps to purchase on our easy to navigate site.